Former FBI Director James Comey used his personal email account to discuss his agency's investigation into Hillary Clinton's unauthorized private email server. Through a Freedom of Information lawsuit, the Cause of Action Institute, a conservative watchdog group, obtained some of the emails Comey sent from a Gmail account and revealed them Friday evening. 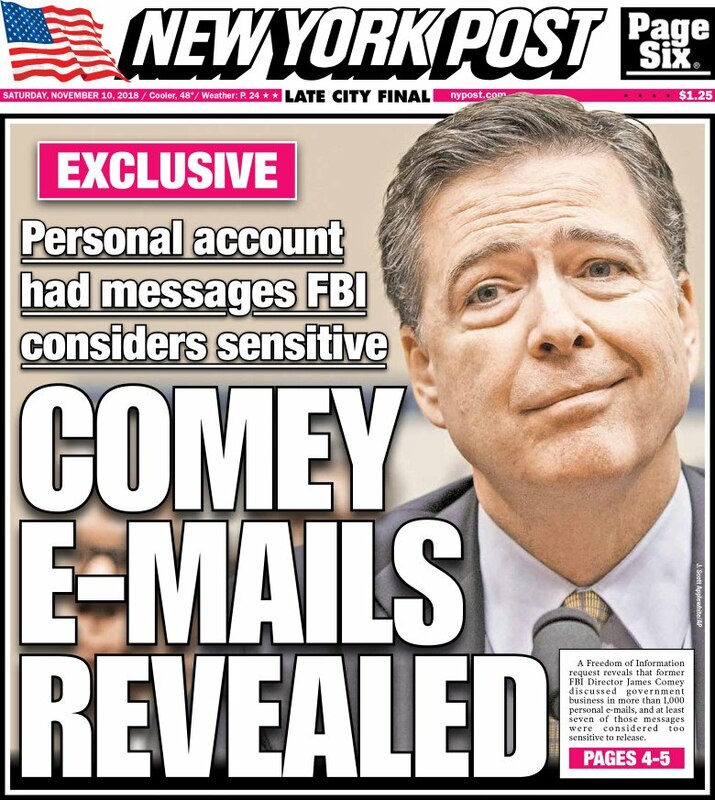 Comey is investigating Hillary for using an illegal server and uses a personal email account to discuss the case. You’d almost believe these dummies wanted to be hacked. Bubba74, Northern Flash, jimmy g and 2 others like this. You just can't make this level of idiocy up. These have to be the most incompetent people to ever work for our Govt. Most of the foreign countries likely have all of our intelligence from the Obama era error. China was reading all Hillary’s emails in real time so probably was Iran. I still believe that played a part in the Benghazi attack. Let's not forget our President likes and prefers to use his own personal cell phone, because it's inconvenient to use the others. And lets also realize above all the that it wasn't CNN or a "fake news" organization that broke the story about President Trump having full knowledge and participation in the payout to horseface. It was the WSJ. Aka News Corp. Aka parent of Fox News. Old news or fake news? Nobody cares. That's what I figured from you. I was just trying to point out you will rail against the left for the same type of our President does and dismiss his bull as old news or fake news. And lets face it, if a CNN reporter had broke the story about the horseface payout, they would likely be another enemy of Trump and considered fake news. That's where our world is now, right and left. Paying a stripper to go away isnt germaine to anything. Having China, Iran, and others read unsecured government secrets is. Rastus and Northern Flash like this. You’d almost believe these dummies wanted to be hacked. and if you question it, you a "insert your favorite term here"
Rastus, jimmy g, Northern Flash and 1 other person like this. Don’t believe him? Look at what is happening in Broward County right now. That's what I figured from you. I was just trying to point out you will rail against the left for the same type of : : our President does and dismiss his bull : : as old news or fake news. And lets face it, if a CNN reporter had broke the story about the horseface payout, they would likely be another enemy of Trump and considered fake news. How many times do you have to be told that paying someone to shut up is not a crime? It's done by politicians and corporate big shots all of the time. So again, that's why nobody cares. It's not illegal. Well I've only brought it up once so you've told me your opinion once. That's called math, 1+0=1. And the point wasnt whether it was illegal, it was that the Beloved News Corp broke that story story. And the other part of my post was about you railing on Dems for using unauthorized commincations when President loves to use his own cell after being advused not to. Now I've mentioned that twice. 1+1=2. See how that works. We've talked about the legalities and illegalities on this issue for months on here, it's not our problem that you aren't on here very often. And paying people to keep quiet being LEGAL isn't an opinion, it's a fact. It's perfectly legal, it happens all of the time. In fact, there is a slush fund in Congress for paying people to be quiet. You are really good at that math thing. But did it require help from someone else? It would depend on the President’s conversations Hillary and comey would have been fine if if they limited their communications to nongovernmental issues, the point is that they didn’t. Also don’t forget one of Trumps entire conversations with a foreign leader was leaked to the press, maybe he doesn’t trust the government system with good reason. The absurd is common place.